Recently the Summer Institute conquered the Eno (Occoneechee) Mountain. They went to the top collecting data along the way. They marched their way up the treacherous trail of the mountain taking plant life samples, transects, and learning about the geology and mining of Occoneechee. The mountain is located in Hillsborough, North Carolina. "It was okay hiking up the mountain," Andrea says. The majority of the students at the Summer Institute enjoyed the trip up the mountain. 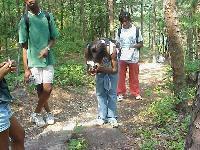 Yolinda says, "It was a great experience hiking up the mountain and collecting data!" The students collected this information on their way down from the mountain. They were in groups of six doing searches for plants and animals. Also they had to identify different plants and animals. 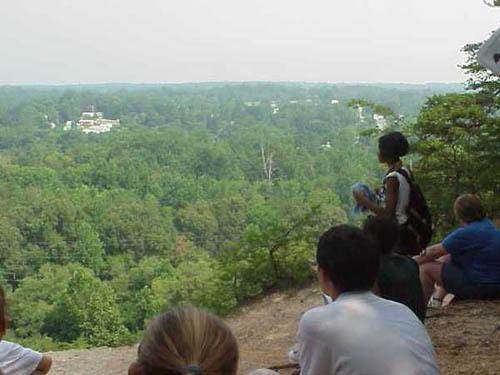 The students reached the top of the mountain which is approximately 250 feet in the air. This mountain wasn't created just like any other mountain, it's only there because the land around it was eroded. Parts of the mountain once were Hot Springs. At some points on the mountain there are mines where minerals are dug up. But what's interesting about this is that they dig at the rates that the trees grow so the people in town can't tell the difference. "It was interesting when you contrasted the temperature below the mountain and on top of the mountain. It was a great learning experience!" Beth said.